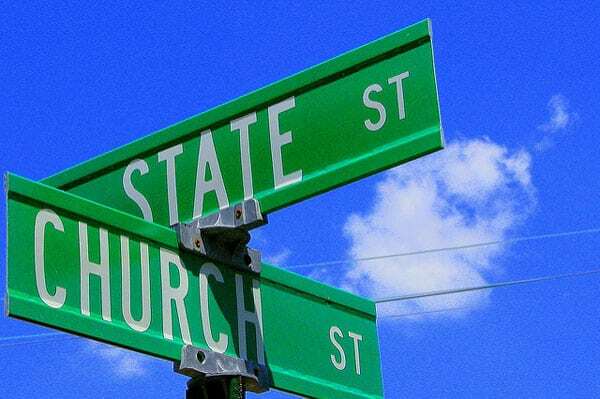 “The Intersection of Church and State,” Ben McLeod. Last summer, the Supreme Court ruled in the Trinity Lutheran case that Missouri must provide funds to an otherwise qualified church-sponsored preschool under a program designed to improve playground safety. At the time, NPQ warned that “the repercussions will send ripples through public and parochial school programs across the country.” Now, two new suits have been filed, one in the state of Washington and one in Maine, seeking further easing of the separation between church and state when it comes to school funding. In Maine, communities that are too small to financially support their own schools provide financial support to families that can be used to pay tuition at other public or private schools. Currently, Maine, based on the need to separate church from state, does not allow those funds to be used for a church-sponsored school. According to Maine’s Sun Journal, the suit filed last week in Bangor’s US District Court challenges this decades-old law. The personal nature of the issue is illustrated by the story of one of the Maine litigants. [One daughter] “soon will begin her sophomore year at Erskine Academy, and…receive the tuition reimbursement that pays for her education. But their son…is headed into seventh grade at Temple Academy, a private Christian school in Waterville, and the cost of his education will be entirely on them during his high school years. [The] state government operates a…program that pays a portion of college students’ wages for part-time jobs, often in fields related to their majors. The program allows students to earn money for school, reduce reliance on student loans, and gain valuable job experience. Students may work for almost any type of employer—public or private, for-profit or nonprofit. Employers the state deems “sectarian,” however, are excluded, no matter what job the student may perform. From an organizational perspective, the nonprofit community finds itself on both sides of the issue. State funding is a valuable commodity that some church-affiliated organizations desire. Advocacy organizations like the ACLU and Americans United for Separation of Church and State staunchly support a strong wall, while others, like the Institute for Justice, which has provided the legal resources for these two new suits, see the current situation as being anti-religion and in need of change. The Court leaves open the possibility a useful distinction might be drawn between laws that discriminate on the basis of religious status and religious use. Respectfully, I harbor doubts about the stability of such a line. Does a religious man say grace before dinner? Or does a man begin his meal in a religious manner? Is it a religious group that built the playground? Or did a group build the playground so it might be used to advance a religious mission? For private, religiously affiliated colleges and universities, new funding opportunities may soon become available. For public and non-religious private schools, there will be greater competition for already scarce funding.